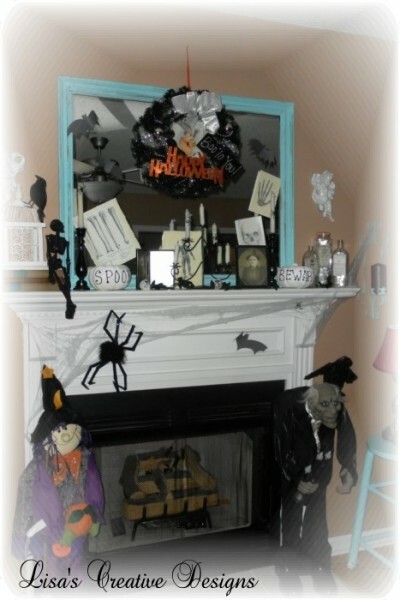 As I mentioned last week, we are hosting a Halloween Party at our home on October 29th and have been in a frenzy getting the house ready. 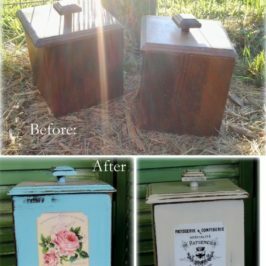 Today I wanted to share a FEW photos of what I have been up to. I am sorry to say I cannot give you a full tour today as I still have some finishing touches to do. I promise to do a full expose on the party, giving you the full lowdown of the event. It was nice. I was happy with it but wanted to give it a different look this year. Here it is. I have a new aqua mirror above the fireplace now. I was tempted to paint it black just for Halloween but thought that would be going a bit overboard. 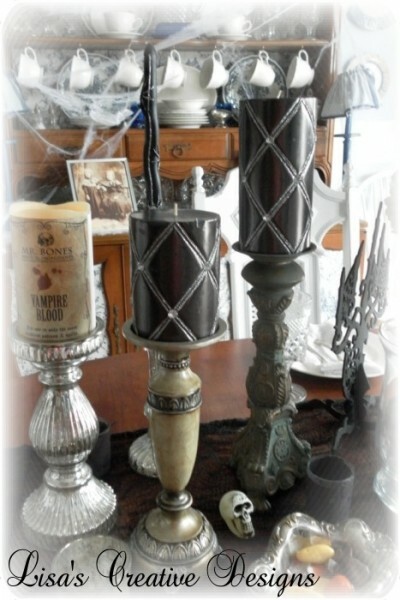 The black candleabra was a thfift store makeover from a few years ago and so was the black candlestick holders. 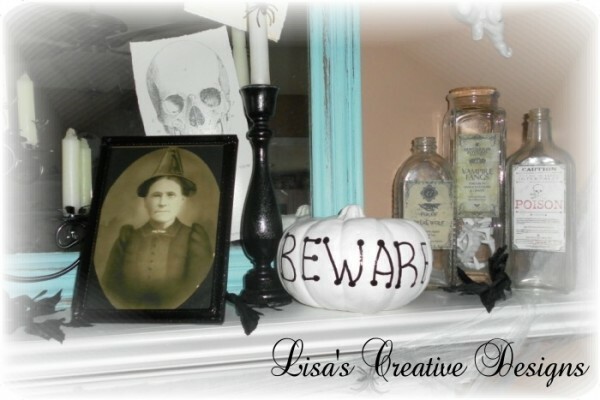 Old bottles got a spooky new look with some vintage inspired spooky labels. My white pumpkins were a Dollar Tree find about 3 years ago. I gave them a coat of white paint and painted Spooky and Boo on them. Some old thrift store books seemed fitting. The gruseome photos were found on the internet (No it isn’t my Uncle Bob or me before I have my coffee in the morning, even though I feel that way sometimes!) 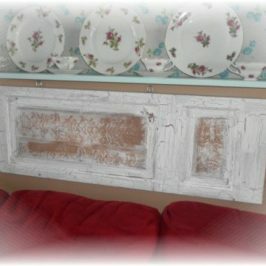 I sent the images to Walgreens to print up and I placed them in a few old metal picture frames I found at my favorite haunt. I spray painted them black of course. 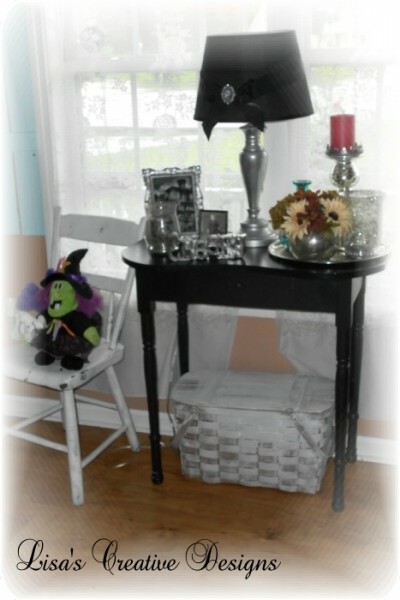 Here’s a little vignette I created on a side table in my living room. 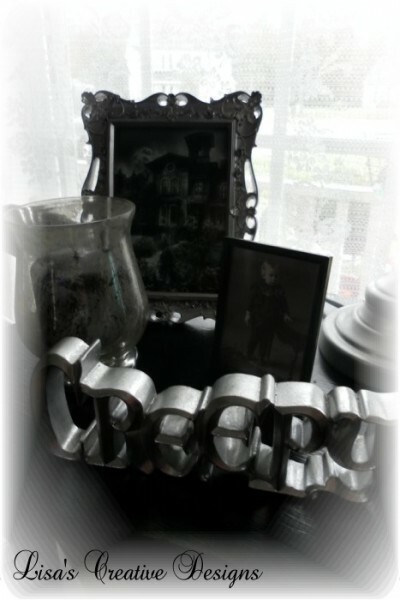 More old pics, a black candle in my mercury glass candle holder and a CREEPY sign I found at Michael’s. 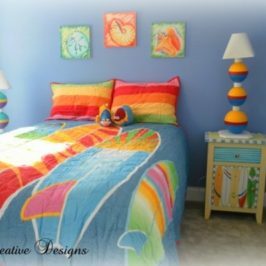 I bought quite a bit from Micheal’s this year (Really great stuff too!) marked at 50% off! 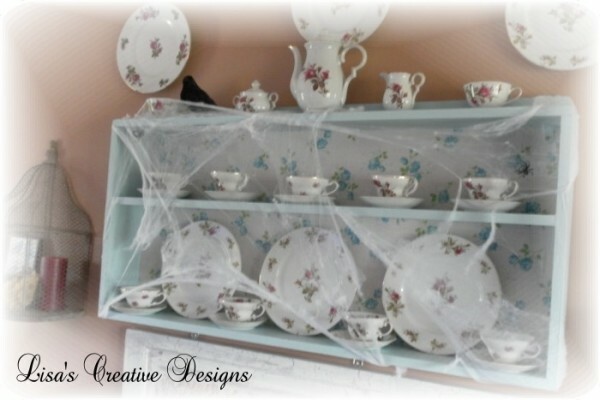 Even my pretty rose china display gets creepified with some good ole’ cobwebs and a crow. Let’s move on into the dining room. I LOVE how my tablescape turned out. 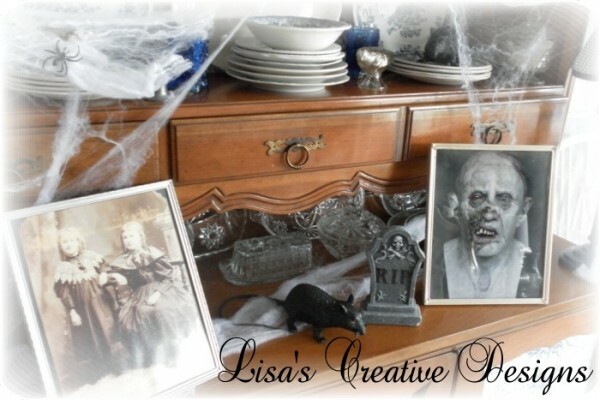 I set the table with a “Spooky Halloween Dinner Party” in mind. 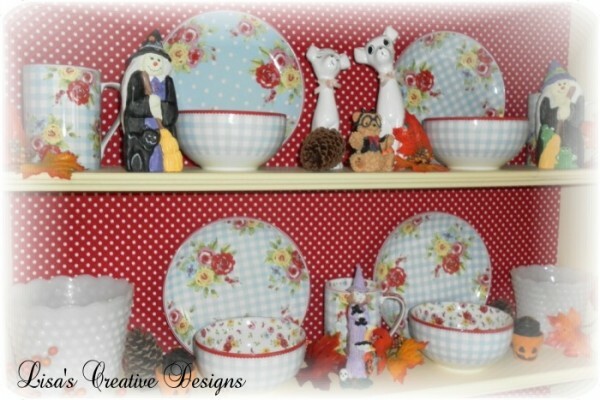 I dressed up alot of my everyday decor pieces to fit the theme. 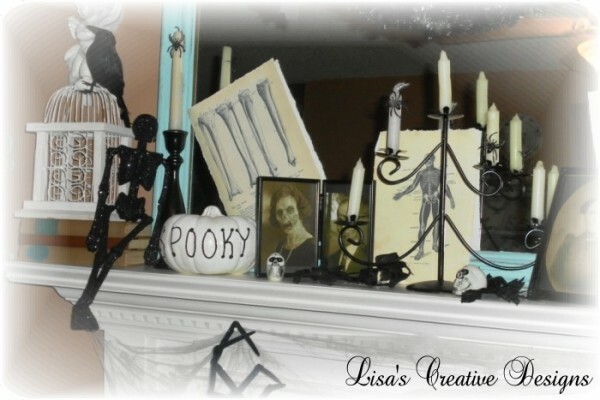 I dressed up my everyday mercury glass candle holders by adding some spooky candles. 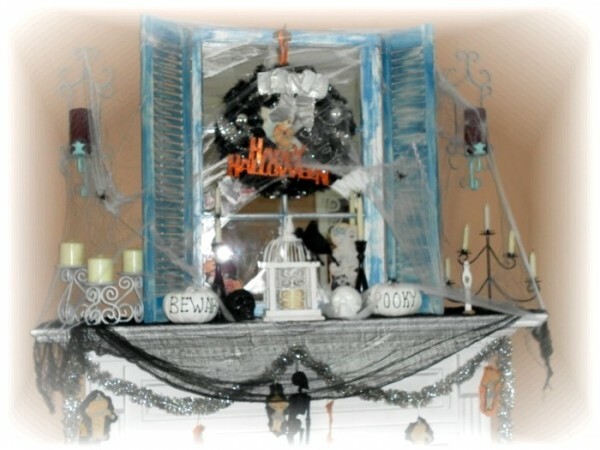 I love my mercury glass and I just didn’t have the heart to pack it away in a box until Halloween was over. I think it adds sparkle and a sense of elegance to this tablescape. The beautiful black candles were a 50% off score at Michaels. 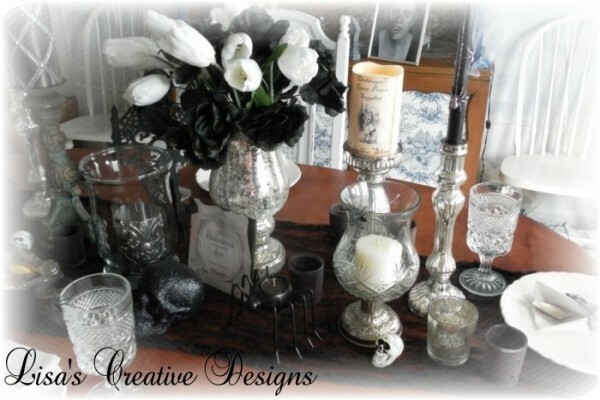 White tulips and black silk roses adorn my newest mercury glass piece. (Shhh. Its actually a candle holder! If you don’t tell, neither will I) It had a great shape and the perfect scale for the table. 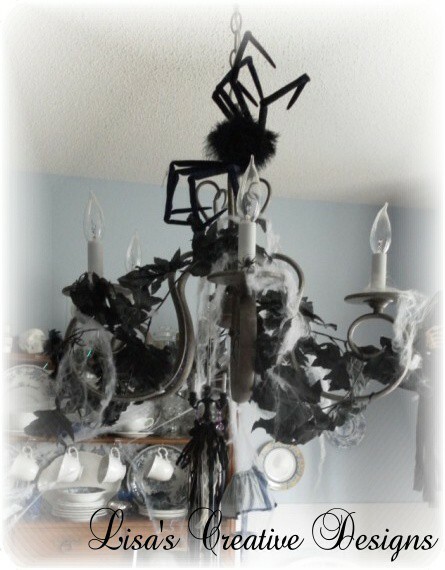 The chandelier got embelished with some silk black leaf vines, spider webs and a big sinister spider creeping down it the chain from the ceiling. I have these really cool flickering bulbs I will be putting in the chandelier on Party night. They create an awesome effect. 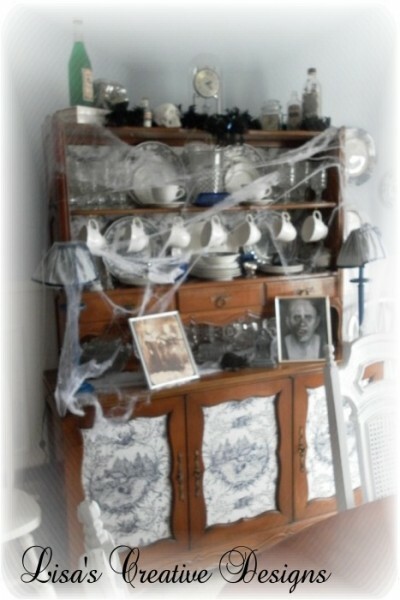 My china cabinet looks as though it hasn’t been dusted in years with all the cobwebs abound. 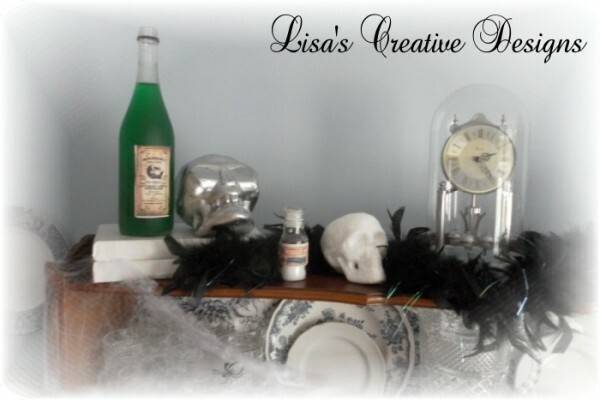 ….. “Poison” bottles and skulls complete the design. 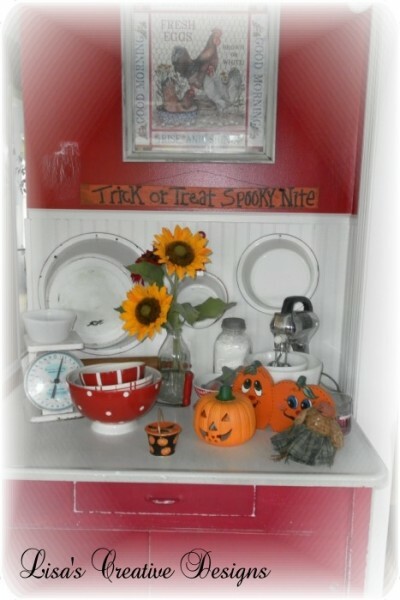 Even my red and white polka dotted kitchen gets all dolled up but on a lighter, less sinister note. 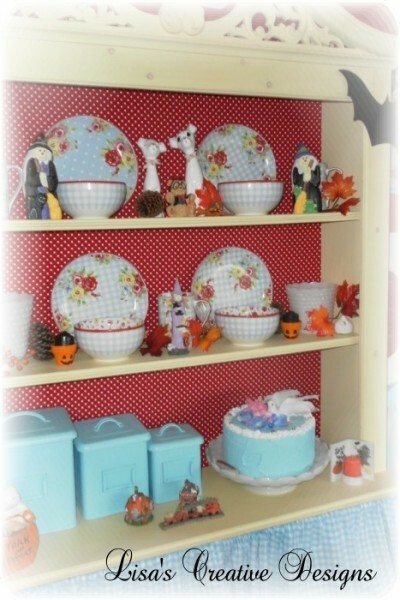 Cutsie little Country Pumpkins …. Fall leaves and pinecones complete the look. So that’s it folks! What do you think so far????? 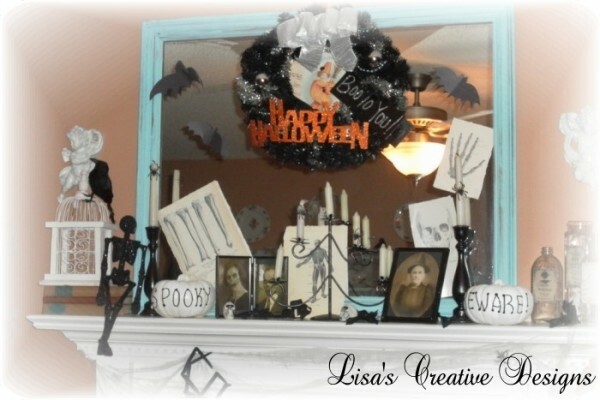 I have been having a ball decorating for Halloween this year. I was not planning on hosting a party again this year but decided go forward with it after my kiddies and husband put in a request. Considering I only had a few weeks to plan I think its comiing along quite well. It has got my wheels turning though. Boy what could I come up with if I had more time and unlimited funds?! Wouldn’t it be awesome to rent an old abandoned house for the night and just go crazy designing a “Haunted House Halloween Party”? 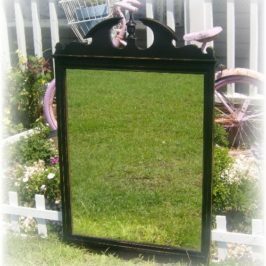 Thank you for the invite to your blog party! I am away right now waiting the arrival of my newest grandchild and have limited computer access. But if I get home in time I will join in. 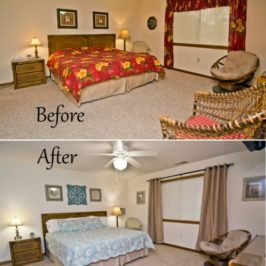 Your decorating is brilliant! So fun and so very Halloween! You have mixed beauty and spooky very well. 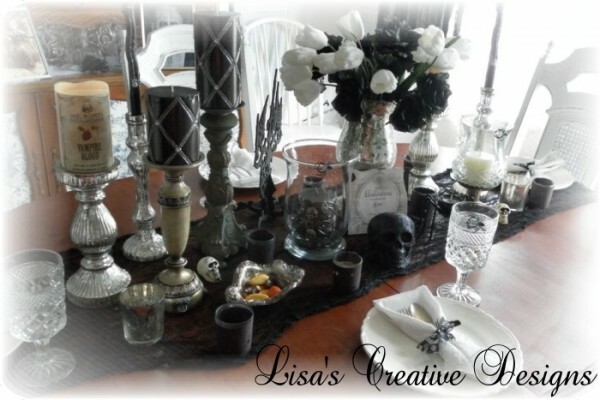 So many great ideas, Lisa! Great job! Spooky! Thanks so much for hosting!